Crusaders coach Scott Robertson ruefully declared "Israel Folau should be working for NASA" after the superstar's stunning aerial display brought the record‑setting Super Rugby champions crashing back to earth. 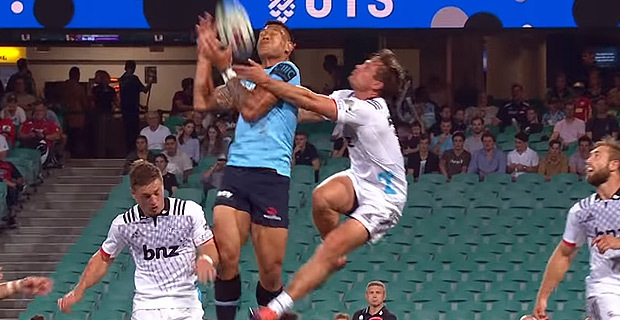 Folau became Super Rugby's all‑time joint record try scorer as the NSW Waratahs snapped the Crusaders' record 19‑match winning streak with a 20‑12 victory last night. Robertson says Folau is pretty good in the air. Looking at other results, the Hurricanes overcame the Stormers 34-28, the Chiefs thrashed the Bulls 56‑20 , the Lions beat the Sunwolves 37-24 while the Sharks defeated the Rebels 28-14. Meanwhile, the Brumbies will face the Reds at 5.05pm.